“That looks like a good book!” I said as I walked past a young man reading, The Power of Positive Thinking. His face lit up as he shared how much the book was helping him. We agreed that now, more than ever, people need more positivity in their life. And the book was serving as a good reminder on how to focus more on positivity, at a time when so much negativity and chaos is afoot. “It also helps me to protect myself from other people’s anger and upset. I’m more able to stay positive now when other people come at me with their stuff. It’s too bad people do that to one another,” he shared. And I agreed. “To Davis!” I exclaimed. Because that was quite a change to the say the least… “You must have quite the story to tell,” I said. Ramal said he had applied for a job opening working at the Davis Food Co-op, hence, we met at one of the tables while he was on his break and I was on my way home after work. First, we talked more about meditation techniques. He was so excited to hear that there were free Introduction to Meditation classes, especially online. He wanted to take the next step but cost was an issue, so, fortunately, there are many ways to learn for free. 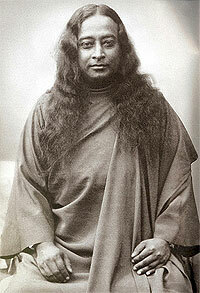 Paramhansa Yogananda is also called the Father of Yoga to the West in Phil Goldberg’s book, American Veda. We talked about whether he had read the best-selling spiritual classic about yoga called Autobiography of a Yogi. He was elated when I shared that in the book, the author, Paramhansa Yogananda, explains the teachings of Christ in a way that helped me feel closer to Jesus than I ever had before, despite my upbringing. We talked about the Bhagavad Gita, also known as the Bible of the East. That the book was a blend of East and West. That Steve Jobs had the book given away at his funeral and had read it every year during his life. I shared that I had started reading the Autobiography just a few pages a day my first time, but that it changed me. 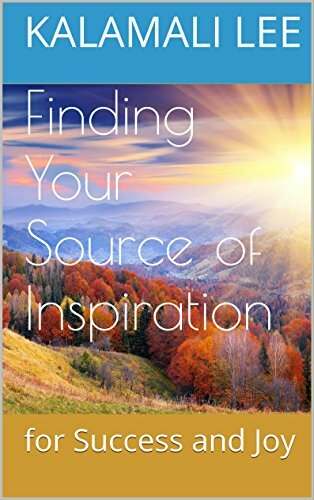 I added, “You might think some parts are a bit out there, especially in the beginning, but forge ahead, it’s an amazing book. I offered him the extra copy from my car and he was so happy to have more goodness to read. He said he had been feeling like quitting his job today, talking to his manager about how hard it was, but that now he was feeling good about everything again. Like our meeting had turned things around. We talked about how neat it was that we had sat nearby for a moment. How sometimes there are just moments where you are drawn to other positive people. He said to call him, “Mal,” and stop by and see him anytime, Monday through Friday. Whenever and wherever we go, it is a possibility that we could be that messenger, that instrument for a ray of hope or joy. We are so blessed if we are on the spirtual path, to be able to share it with others. Divine Mother, may your love shine forever on the sanctuary of our devotion, and may we be able to awaken that love in all our hearts.